After breakfast, we climbed on the bus and headed towards St. Malo. St. Malo is an old city dating back to the Middle Ages that borders the English Channel in northern France. St. Malo was once restricted to life inside the fortified remparts that surround it, but has since spilled over its walls into the surrounding area; however, today we were only able to tackle the walled portion. As we pulled in, we saw that the French Naval ship, Tourville, was docked in the channel; Claire enlightened us that if you touch the red pompom on a French naval officer’s hat, it will bring you luck… but she made sure to also tell us to ask him before doing so. 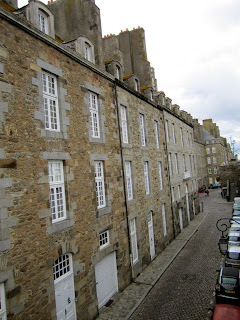 We then grabbed our lovely picnics and climbed St. Malo’s remparts to eat them. St. Malo seagulls. It’s a serious problem- we’re talking ambush/sneak attacks to unsuspecting civilians from behind. After lunch, I went tide-pooling and walked the beach for a bit. Then, Robin and I climbed back up the remparts to walk them in their entirety. After we came full circle, Robin and I went French naval officer hunting. We found one, and definitely asked if we could touch his hat for luck. After, we went back into the city to drift along the streets and see the shops. I was lucky enough to find my third pair of sunglasses on this trip for under five euros. Success. After our trip to St. Malo, everyone caught ‘beach fever’ and began discussing a beach trip for one of our free weekends. We arrived back in Angers an hour ahead of schedule so Brandy, Hannah, and I grabbed a catnap before dinner. The menu was: leek soup, salad, potato/beef casserole, and fresh cherries. Over dinner, Ghistline asked us about our plans for our upcoming free weekend. We told her that we didn’t really have any set plans yet, which set off a flurry of words, some dictionary action, and finally a conclusion. Our host family wanted to take us to their second house in the countryside of the Bretagne region. ROADTRIP.